So you might be wondering, after reading this month’s Recipe ReDux the challenge, why I am sharing a smoothie bowl. I just realized, after seeing other blog posts from fellow members, that I greatly misunderstood this month’s challenge. I guess we all know what was on my mind when I read the simply-worded, no-brainer, obvious theme for October. So, here we are. No doubt I misunderstood, this is still a nutrient-packed, slightly protein-packed, delicious power bowl — if you must. 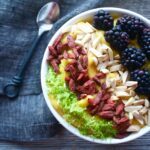 Gorgeously hued, the color suggests how many nutrients are in this creamy smoothie bowl. Mango does the heavy lifting in this version acting as the base and adding tons of fiber, vitamin A, and vitamin C.
Banana and protein powder (if you choose to use it) offer a light, airy texture. Additionally, the banana adds fiber, vitamin C, B6, and Magnesium. Then bump up the nutrition even more with a sprinkle of turmeric, which adds antioxidants and anti-inflammatory compounds —plus it amps up that gorgeous color. Finally, add vanilla extract for a touch of natural sweetness and to balance out the flavors, and for a tropical twist add a splash of coconut extract. I chose to top this smoothie bowl with fresh black berries, goji berries, toasted slivered almonds and lime zest. I meant to add unsweetened shredded coconut, but completely forgot to add it (I’m on a roll, huh?). But don’t let these suggestions limit you. Choose toppings that you prefer; kiwi, pineapple, raspberries, nut butter, hemp seeds, flax seeds, the options are endless! Add mango chunks and banana to a high-powered blender or food processor. Let fruit slightly thaw for 5-10 minutes. Add almond milk, lime juice, vanilla extract, coconut extract, turmeric, and protein powder (if using). Transfer to a serving bowl and top with desired toppings.